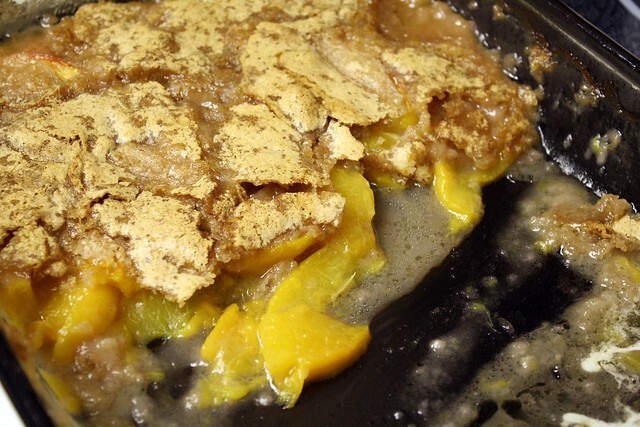 Nothing says summertime like fresh peach cobbler!! Oh my goodness, this was so so good. Fresh summer peaches make all the difference in the world. It is even better served with vanilla ice cream! Don’t let summer pass by without trying some! You will be glad you did! Preheat oven to 350 degrees F (175 degrees C). Pour butter in to the bottom of a large casserole or 9 x 13 inch pan. In the prepared dish, toss together the peaches and 2 tablespoons sugar. In a mixing bowl, combine the 1 cup sugar, salt, baking powder, flour, cinnamon, and milk. Spoon batter over the peaches. Bake for 45 minutes in the preheated oven, or until top is golden brown. Posted on June 23, 2011 December 7, 2011 by cookingwithpizazzPosted in DessertTagged Dessert.